PREVENT is a government strategy designed to avoid people being drawn into terrorism or supporting terrorist or extremist causes. The PREVENT strategy covers all types of terrorism and extremism, included the extreme right wing, violent Islamist groups and other causes. From July 2015 all schools have a duty to safeguard children from radicalisation and extremism and have ‘due regard of the need to prevent people from being drawn into terrorism’ (Section 26 of the Counter-Terrorism and Security Act). This is also known as the PREVENT Strategy and its primary concern is to protect children and young people from radicalisation by extremist ideas and ideologies. Extremism is the vocal or active opposition to Fundamental British Values. What does this mean in practice at Temple Moor? Many of the things we already do in school to help children become positive, happy members of society also contribute to the PREVENT strategy. The Fundamental British Values, taught at Temple Moor, explore other cultures and religions and promotes diversity. We support young people in this, providing a safe environment for discussing controversial issues and helping young people understand how they can influence and participate in positive decision-making. What do we do if we have a concern? 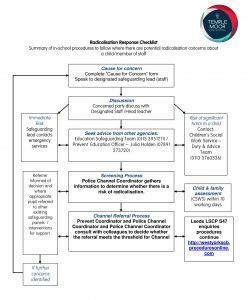 If a concern is raised about a child, or member of staff, around radicalisation, we operate the following procedures. and supports them in fulfilling their ambitions.